Finding high-level structure in scores is one of the main challenges in music information retrieval. Searching for a formalization enabling variety through fixed musical concepts, we use parametric grammars, an extension of context-free grammars with predicates that take parameters. Parameters are here small patterns of music that will be used with different roles in the piece. We investigate their potential use in defining and discovering the structure of a musical piece, taking example on Bach inventions. 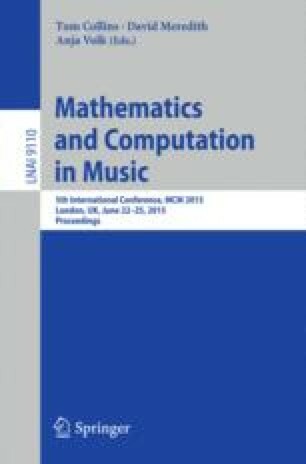 A measure of conformance of a score with a given parametric grammar based on the classical notion of edit distance is investigated. Initial analysis of computational properties of the proposed formalism is carried out.